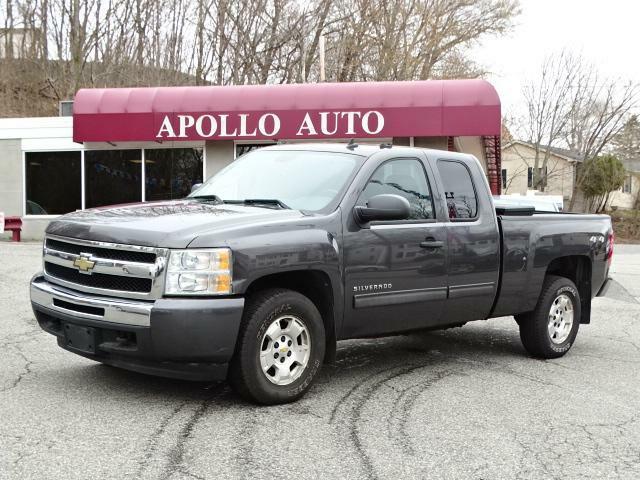 Apollo Auto Sales is honored to present a wonderful example of pure vehicle design... this 2010 Chevrolet Silverado 1500 LT only has 132,000mi on it and could potentially be the vehicle of your dreams! This 4WD-equipped vehicle handles any condition on- or off-road with the sure footedness of a mountain goat. With unequaled traction and stability, you'll drive with confidence in any weather with this Gray 2010 4WD Chevrolet Silverado 1500 LT. This vehicle won't last long, take it home today. There are many vehicles on the market but if you are looking for a vehicle that will perform as good as it looks then this Chevrolet Silverado 1500 LT is the one! More information about the 2010 Chevrolet Silverado 1500: Although the full-size trucks from Ford and Dodge have both been more recently redesigned than the Chevrolet, the Silverado is one of the most refined, best handling full-size trucks. EPA ratings for 2010 go as high as 22 mpg highway for the Silverado XFE version. Full-size trucks are used in such a wide range of situations--from construction fleets to long-distance driving--and the two different interiors offered in the Silverado and the nearly identical GMC Sierra help satisfy shoppers better than most other competing models. LS and LT models are probably the best fit for buyers who need the sturdy, get-messy capability of a pickup at least some of the time, but the LTZ is the choice for those who need a pickup but won't compromise luxury. And for those who need a pickup but want to make a greener choice, with even lower operating costs, the Silverado Hybrid has 25-percent better fuel economy without sacrificing much towing or hauling ability. This model sets itself apart with strong tow ratings, fuel economy, Top-notch interiors to suit work or luxury use, and extensive features and options Apollo Auto Sales has been in Business Since 1972. We Specialize in Late Model-Low Mileage-Fully Serviced Vehicles. Apollo Auto Sales practices a Velocity Based Pricing Strategy which provides a Transparent Sales Process and Excellent Overall Customer Experience. Please Call Us to Check Availability and to Schedule your No Hassle-No Obligation Test Drive!! Call 401-728-8998 or Click: www.apolloautosales.com.